Lemma 1. $d(s, t) = min(d(s, v) + d(v, t) : v $ is settled in both searches $)$. Proof. We only give a proof outline for self-containedness since the CH-query is a special case of the HNR-query for which a detailed yet simple correctness proof is given in . In particular, here we only consider the case where shortest paths are unique. Let $v$ denote the largest node on the shortest path $P$ from $s$ to $t$. 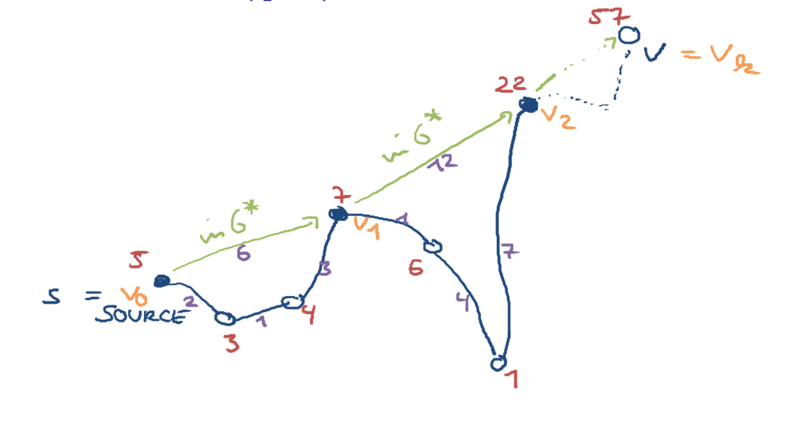 We first claim that the sequence of prefix maxima of $P$ forms the shortest path from $s$ to $v$ in the upward graph $G↑$. If $s = v$ there is nothing to prove. Otherwise, consider any pair $(u, w)$ of subsequent prefix maxima in $P$ and the overlay graph $G′ = (u..n, E′)$ existing at some point during contraction. Since the shortest path from $u$ to $w$ uses only interior nodes smaller than $u$, and by definition of the properties of an overlay graph, $(u, w) ∈ E′$ and $c(u, w) = d(u, w)$. Moreover, $u < w$ and hence $(u,w) ∈ G↑$. Analogously, the sequence of suffix maxima of $P$ forms the shortest path from $v$ to $t$ in the downward graph. Browse other questions tagged algorithms graphs shortest-path or ask your own question. Distance of a Graph node to a group of nodes?